Let's talk about job pricing! 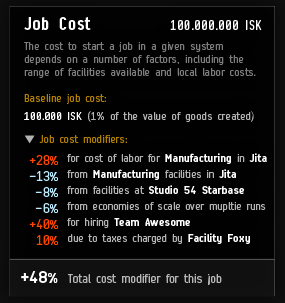 Currently, the amount you usually pay for installing a manufacturing or research job in EVE Online is on the order of tens of thousands of ISK, which is such a small cost that it's not really relevant to most build decisions. This has never been entirely ideal, but a couple of upcoming developments in Industry coming in the summer release mean that more "decision-relevant" job costs are an important piece of the puzzle. First, the imminently arriving “Work Teams” (stay tuned for a later blog) will give people a strong reason to want to do their work in particularly well-staffed systems. Second, the removal of slots (as discussed in CCP Ytterbium's earlier blog) means there's no hard limit on how much work can be done in a given system. The first is intended to act as a "pull," giving people a reason to come together and build in the same space, and the second allows players to do so in a more organic way. Counteracting this will be pricing that rises in line with activity, acting as a "push" to incentivize people to spread out. Carefully balancing these two forces gives industrial players another decision to make, and having the values be both continuous and varying over time (on the scale of weeks and months) creates a decision that 1) has an interesting range of options; and 2) has the potential to change over time. This, we hope, will -- in conjunction with rounding off a lot of the rough edges and making the mechanical work easier -- move industry from a play-style dominated by clicking to one driven by smart, long-term decision-making. First, we're hoping to broadly maintain the current balance of manufacturing between hisec, lowsec, nullsec and w-space with these changes, purely because it reduces the risk of the changes as a whole. We're hopeful that the summer release will make manufacturing in nullsec more viable, but we're not attempting to comprehensively address nullsec industry in this expansion as it needs to be done as part of a wider consideration of the nullsec ecosystem. Second, to be totally clear, all the pricing modifiers being discussed here are modifiers to the installation cost of a job. With the exception of outpost manufacturing upgrades, nothing in this blog is offering a material cost reduction. So, when you see "0.5x cost modifier", please keep in mind that that's modifying the installation cost, which is typically 1% to 5% of the material cost. OK, let's get into the meat. We aimed to create a pricing system that responded to player activity by raising or lowering prices, but in a way that didn't require us to decide on a fixed relationship between activity and price. A fixed relationship would not be future-proof, and also would likely make no sense on the Serenity server (the Chinese mirror server to Tranquility), which has a different population dynamic. We experimented with faking a market, with the server acting as the seller, but while functional that approach ended up being bad gameplay (prices would rise in a system until a significant number of players moved elsewhere, which is pretty rubbish). What we're doing instead is setting the base price for a job based on two factors: the cost of the job output, and what fraction of the universe's total job-hours are being done in a given system. These are framed as workforce cost, i.e. the cost of hiring the skilled workers needed to run the facilities in question. The workforce is pretty footloose, being able to work anywhere in the system, and the more demand there is for their services the more they will generally charge for it. This applies the same everywhere, including wormholes. Even on the unknown edges of space, building stuff still requires people to run the machines. Let's break that down some. Run cost is calculated per activity type (manufacturing, copying, Material Efficiency research, etc. ), per system. That is, at a given time, the base cost for a given run will be the same everywhere in a given system. Multi-run jobs will obviously cost some multiple of this. Price of output is based on the system used for calculating values in killmails, which is also used to manage bounty and Factional Warfare (FW) kill payouts. We're very aware of the risk of price manipulation, but we're pretty confident this system is robust in this regard. The one deviation we're making is that, just for the purposes of pricing jobs, blueprints are assumed to be worth 2% of the value of whatever they build, so research jobs don't end up being outrageously expensive. To give an example, let's take an Abaddon, and let's say for the sake of easier math that it has a calculated value of 200 million ISK. Fraction of global job hours is calculated as a moving average over the past 28 days, so it will be substantially “non-swingy”. We're taking its square root to create a bigger spread between more and less active systems. It should also be noted that, again, this is per job type, so we're comparing (for example) the number of copy-hours in this system over the last 28 days to the number of global copy-hours over the last 28 days. For manufacturing, we took a snapshot a while back and the highest system had a fraction of 0.0253 (i.e., 2.5%), or 0.15 after you square-root it, and a more typical square-root value for a semi-busy system would be around 0.05, giving our Abaddon a base job cost of 10 million ISK. If you spread the hisec manufacturing load (~85% of total job hours in the snapshot) even across the whole of hisec, you end up with base job cost of 2%, or 4 million ISK. There are then a number of things that can affect pricing. Team costs: choosing to hire a specialized team will come with a cost. This will be explained in the upcoming Teams blog, but for now all you need to know is it's a multiplier, and it's one of the two modifiers that can make a given price larger independent of system activity. For now we'll not use a team with our Abaddon, so the cost is still 10 million ISK. For NPC stations, these multipliers range between 0.95 and 0.98, based on how well the station's activity (factory, testing facility, warehouse etc) is judged to be suited to building and/or researching things. Stations can have different ratings for manufacturing and research. These are not huge numbers, but because they multiply together they can have a big effect. In manufacturing, the current record-holder in empire space is Nonni, with a multiplier of around 0.48 - building things in Nonni will, all other things being equal, halve the cost of installing a job. For conquerables and outposts, we wanted to keep things pretty competitive despite being limited to one per system, so their multipliers range between 0.5 (manufacturing in an Amarr outpost or researching in a Caldari one) and 0.8 (all jobs in a Refining conquerable). A couple of things should be noted here. First, these bonuses apply system-wide, including to jobs installed in starbases. Second, keep in mind that this is still a smallish percentage of the total build cost -- it's not a 50% reduction in build cost, it's a 50% reduction in job installation costs which are typically (well) below 10% of build cost. Let's put our build in a mid-range system, with a multiplier of 0.75. Our build cost is now 7.5 million ISK. Some kind of starbase bonus: we're hoping to add a bonus for having multiple starbase structures at the same time, so removing slots doesn't just mean you only ever need one lab on your hisec research tower. We're still determining exactly whether or how we can get this into the initial release without causing performance issues. Wish us luck! We're not using a starbase in this example, so we're still at 7.5 million ISK. Multi-run discount: makes each subsequent run of a given job cost a little less than the last, mainly to give another small thing that industrialists can optimize for once they've got the basics under control. For each run, the job cost is multiplied by 0.99 raised to the power of however many hours (or fractions thereof) the job will already have run at that point. This is calculated at installation time and therefore the job doesn't actually change price over time. Rather, we do the math up front. We're looking to cap the maximum bonus of this using the old Material Efficiency skill, which will no longer be affecting waste (see previous blog). Let's build five at once. With a build time of 4 hours, our average cost per run drops to 6.93m. Outposts and FW upgrades: These are both places where, previously, you could get more slots. With slots gone and pricing serving a similar purpose, we're transitioning these bonuses mostly into pricing bonuses. For each level of FW upgrade in a system, you'll get an additional 0.9x multiplier to job prices for manufacturing and industry, so level 5 gives a 0.59049x multiplier on top of everything else. For each previously-slot-improving outpost research upgrade, you'll similarly get a 0.9x multiplier to research job prices. For each previously slot-improving manufacturing-related Outpost Improvement, you'll get a 1% bonus to ME instead (we can do that now). This is different because the manufacturing slot upgrades in particular are pretty substantial right now, and installation costs are assumed to be a sufficiently small fraction of final item costs in nullsec that a cost multiplier here seemed underwhelming. We're still looking at the exact bonus here, and the relationship between Amarr and Minmatar outposts in particular, so this may change before it's released. We're building our Abaddon in hisec, so this doesn't matter to us. Taxes: NPC-owned facilities will levy a 10% tax on top of everything else. This will be at least absent in player-owned facilities, and if we have time, we will allow players to set whatever arbitrary tax rate they like on their own facilities, the proceeds of which (the tax specifically, that is) will go directly into their own (or their corporation's in most cases) coffers. Finally, we're in an NPC station, so our build cost goes up 10%, to 7.62 million ISK per Abaddon. There's a fair number of terms there, but they'll rarely all apply at once, and the actual math is very straightforward. The “1% value” is a benchmark we’re using in the UI so we can show activity variation as a +/- percentage, it has no functional power. All numbers are placeholders that I made up months ago. This was just created to show how we would lay out this tooltip, they may not be even ballpark-accurate in some cases! And that's really it. There are a fair number of potential variables, to be sure, but they won't usually all apply at once, and they all just multiply together to get the final number. We think this meets our balance goals, introduces some interesting decisions for players to grapple with, and results in prices that are relevant without being overpowering. On that note, let's look at some examples. Manufacturing: The largest run price we generated from the snapshot we took was 15% of build cost in Saisio. 10th place is Juunigaishi at 8%, while 50th is Kakakela at 5%. Jita is in 106th place, at 4%. The highest lowsec system is at 53rd and 5%, and the highest nullsec system is at 147th place and 4%. Copying: Max is 14% in Vuorrassi, 10th is 9%, 50th is 6%, and we drop below 5% at 95th. TE: The same numbers are 13% in Nomaa, 9%, 6%, 90th. ME: 10% in Abudban, 7%, 5%, 79th. Invention: 12% in Nomaa, 9%, 7%, 119th. Reverse Engineering: 35%(!) in Droselory, 17%, 6%, and there are sufficiently few systems doing reverse engineering when the snapshot was taken that the bottom one is still above 5% of output value. If you've got feedback, comments, suggestions etc, please post in the comments -- we're expecting to continue tuning this all the way to release, so there's plenty of time for adjustments.